Sojourning in a foreign, non-Christian country for missionary work is truly a very challenging venture. But responding to a call for service is more than an adventure. It’s humbling to have connected with Mrs. Perla Camagay, a pioneer missionary teacher and retired principal of Ekamai International School, a Christian (SDA) Institution in the heart of Bangkok. I highly regard and appreciate her for accommodating this online interview. She might have been an unsung heroine in Thailand because of her unprecedented contribution in the field of education, but the sole purpose of this feature is to uphold the Master Teacher whom she’s dedicated her life of selfless service for, and to inspire more educators and OFWs in the ‘Land of Smiles’ and abroad. On December 2007, I had the privilege to visit Ekamai International School. Unfortunately, I wasn’t able to get acquainted with Mrs. Perla Camagay because there was an event, and everyone’s busy. After all, it was just a short visit. Who would imagine that after almost eight years, I would be interviewing the pioneering educator and administrator of that institution? It’s simply surprising! But my short stay in Thailand is insignificant to their sojourn of 48 years! Sharing her exquisite experience, she gave a glimpse of a fulfilling growth and harvest on the foreign field entrusted by the Lord she and her husband served. Q: What has been your motivation in becoming a molder of young minds? Kindly give your family and academic background, and other significant credentials. I come from Cagayan de Oro City, and my husband, Eliseo Camagay, comes from Pozorubio, Pangasinan. We met in Mountain View College (MVC) where he was a college teacher in the Agriculture Department and I was a college sophomore. After my college graduation in 1965, we got married, taught in Mindanao Mission Academy, in Manticao, and in August 1967 we answered the call from the Far Eastern Division (now Southern Asia-Pacific Division or SSD) to go to Bangkok, Thailand, to serve as missionary teachers in Child Training Center (now Ekamai International School). 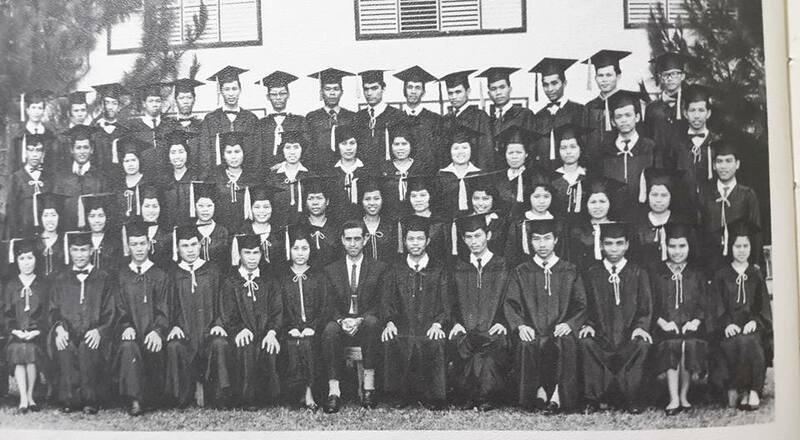 MVC Class 1965 Graduates: Ma’m Perla seated second rightmost. God has blessed us with three adult children and three grandchildren. Our eldest daughter Dr. Janette Camagay-Hamman, a dentist, is in Washington; the second daughter, Dr. Eleanor Camagay-Poblete, a physician is the radiologist in Bangkok Adventist Hospital; and the youngest, Dr. Clyde Camagay, a physician, is the associate medical director in Bumrungrad International Hospital in Bangkok. The credentials I hold include Bachelor of Science in Education from Mountain View College (MVC); Master of Arts in Education from Philippine Union College (PUC), now Adventist University of the Philippines (AUP), and post graduate credits from Southern Adventist University (SAU), Collegedale, Tennessee. 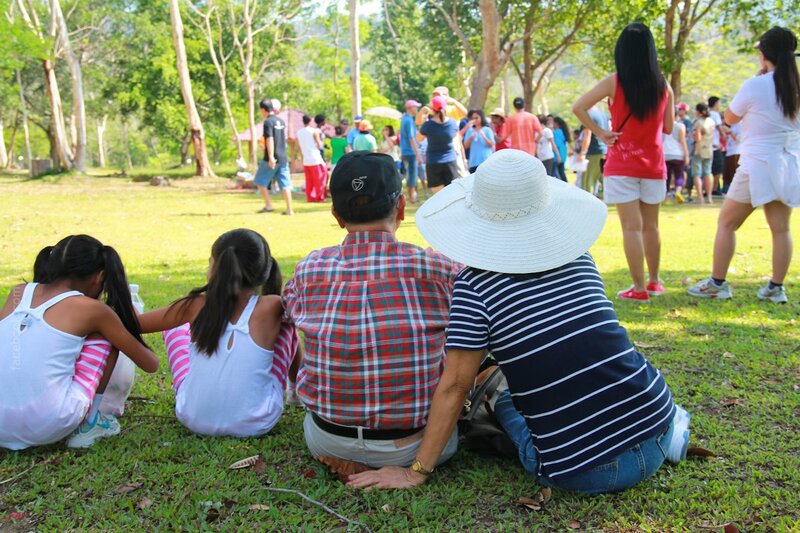 Q: How long have you been sojourning in Thailand and how many years have you served Ekamai International School? A: As residents, my husband and I have been living in Thailand for 48 years. We were away for two years when we had our upgrading in AUP. I served a total of 29 years as a teacher and 12 years as principal for academic administration and for a short time as principal for student administration. When my husband and I first came to the Child Training Center (CTC), we had to take the Thai language and culture crash course after our teaching hours in order to obtain the Thai Teacher’s Certificate, and thank God, all of us foreign missionaries who took it passed the government exam and the school could continue its operation. Shortly after, the school changed its name to Adventist English School (AES), a formal senior high school accredited by The Adventist Accrediting Association (AAA), but like CTC, its diploma was not recognized by the Thai Ministry of Education; that is, our graduates had to take the government qualifying examination for university admission. 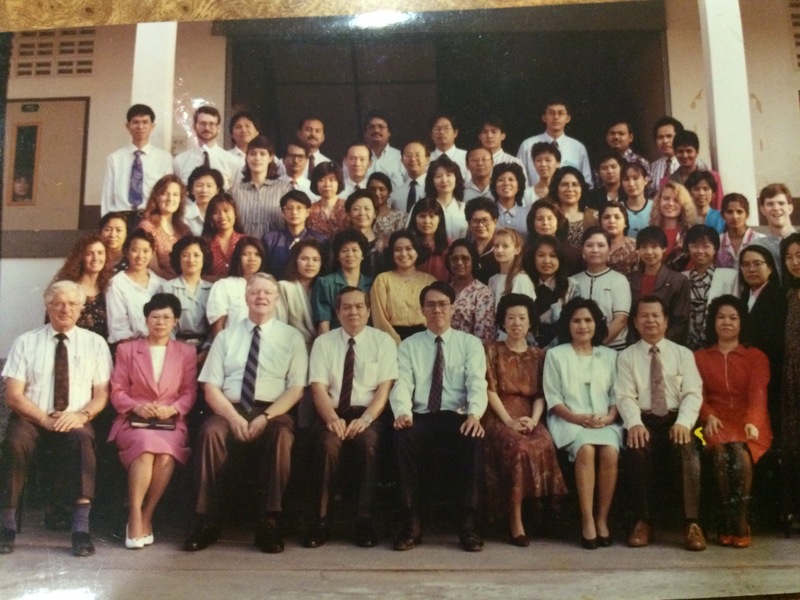 Ekamai International School administrators, teachers and staff. In order for our school to be licensed, we were required to have an external accrediting commission in addition to our internal accreditation with AAA. The answer to that was to apply for accreditation with The Western Association of Schools and Colleges (WASC) in North America. At this critical time of AES, I was appointed by the administration to the position of accreditation coordinator and principal, and through God’s guidance and blessing of wisdom, AES became Ekamai International School (EIS) in 1997, after its full accreditation from Grades 1 through 12 by WASC. Q: As the retired principal of Ekamai International School, what’s your legacy left to your colleagues and to the school? A: As I look back to those pioneering years in CTC, AES, and EIS, I am amazed at how God had miraculously used me, along with support from the administration, the faculty, and Thailand Mission in the development and continued growth of a small unrecognized school of 300 students to over a thousand students who proudly carried their diplomas to local and foreign universities. During my term as principal for academic administration and accreditation coordinator, God blessed the school with the WASC accreditation of 2 full 6-year terms, each with one visit after 3 years. In addition, God blessed us with the AAA accreditation of 2 full 5-year terms. We praise the Lord for blessing the school with the highest terms of accreditation that the school has ever had even until now! When God moves, His work moves forward. God also blessed the teachers with free upgrading so that they completed their Master of Arts degrees in Education from the AIIAS extension program during the summer breaks. Teachers were happy and gave the Lord their best witness and service. Q: What were the challenges you faced living and teaching in a country known for racial discrimination? A: The challenges that I faced as a missionary were the language and cultural barriers. But God used the crash course of Thai language and culture that I completed so that I could openly share God’s love to all of my students and their parents and all my Thai neighbors and friends. Also, it made teaching easier and more fun. Throughout my stay in Thailand I have thoroughly enjoyed the courtesy, kindness, respect, thoughtfulness and thankfulness of Thai people. Q: What are the other ventures and activities you were involved with? A: Throughout my 48 years of living in Thailand, I have always been active in church and evangelistic work which I find very rewarding. Forever young at heart, Mr and Mrs Camagay are big supporters of young people and their activities. Their presence alone has motivated these youth to keep going. Q: What would be your advice to aspiring teachers who would work in Thailand? 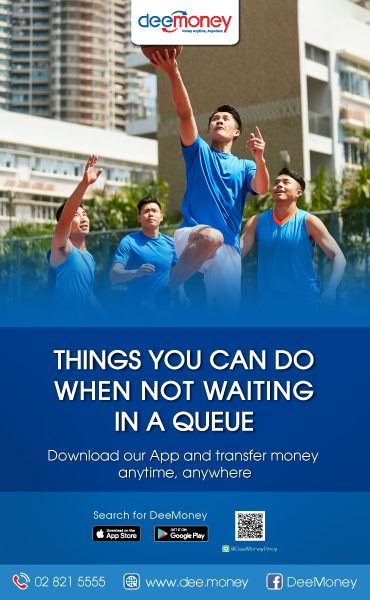 What encouragement would you give to other OFWs who are hoping to give better lives to their families in the motherland? A: My advice to those who are prospecting for jobs in Thailand is short and simple. Be honest and humble, be the qualified applicant, do your best to the point of being irreplaceable, be faithful to your loved ones back home and generously share your blessings with them. May God richly bless you! Mrs. Perla Camagay retired already, but her legacy would continue to inspire and to encourage other molder of dreams. Her passion to serve simply surpassed her profession. That’s what makes her a role model! 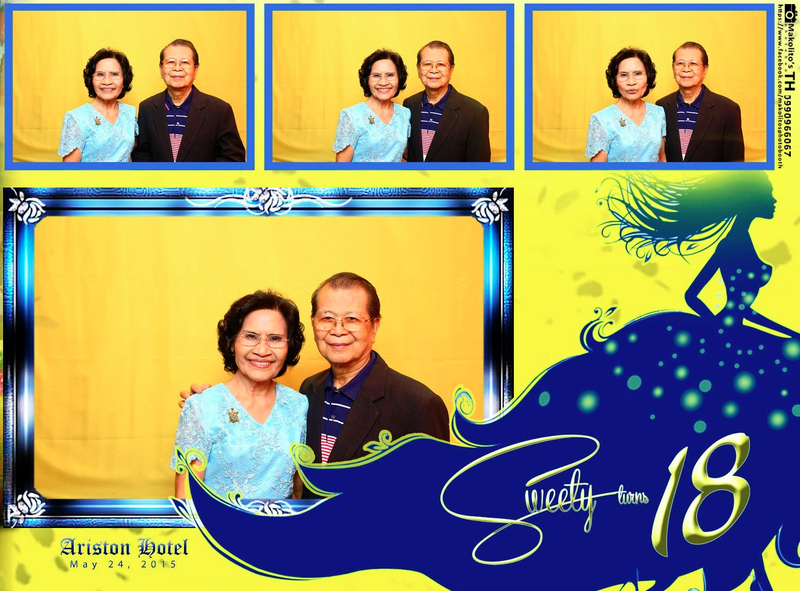 Mr. and Mrs. Camagay having fun at a young friend’s 18th birthday celebration. To prepare for the creation of the ASEAN Economic Community by the end of the year, there’s a greater demand of English teachers in Thailand as stated in the news last week of August 2015: “Thailand Needs 4,000 English Teachers”, more Filipino teachers might venture out. May this article serve as an inspiration to all Filipino teachers and OFWs to give their uncompromising service, and to continuously uphold the significant Filipino values: humility, honesty, integrity, professionalism, patience and perseverance.